Despite the fact that two of my last three blogs have been about other Cities in Australia, there are some moments that make me realise why I love Melbourne. Yesterday was grand final day for the AFL, a day which I really think should be a public holiday for Melbournians. But this whole week, grand final week has been packed full of everything I love about Melbourne. On Monday night, while in Sydney Dave and I met up with my brother to watch the Brownlow together, a grand final week must. Then on Friday for the first time in my life I went to the grand final parade, and even though I was surrounded by Freo supporters I loved being there cheering on my Hawks and wearing my colours proud. 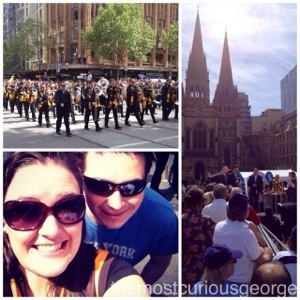 Despite the fact that Hawthorn has been in a few grand finals during my lifetime, Friday was the first time I had been to the parade… I found out that the grand final parade was somewhat of a tradition for Dave who used to go in every year and then headed to the Melbourne show with his Dad and sister. But this was the first time for me and I loved it. There is something really exciting about the grand final week in Melbourne, the atmosphere, the sound, the unity. Simply wearing my hawthorn jumper into the city started conversations with random strangers… it was actually a bizarre feeling. Like Dave’s family tradition we also headed to the show, which brings out the best and worst in everything – but I still love that it’s all there in one place. We have some incredible talent in Victoria and some really strange things as well, but it is incredible to be able to experience all of this at once, whether you are ready for it or not. And then there is grand final day… which, is an experience all of its own… with its own songs, own excitement and own standard dishes – after all what’s grand final day with out a pie? The city has this magic way of coming alive during things like the show and the grand final, it oozes character and fun and it’s just a great place to be. There is excitement and anticipation in the air and i just really really love it! Oh and as much as I love Melbourne I also just wanted an opportunity to brag about the fact that the Hawks won – which makes me very very happy… but it did remind me just why I love Melbourne and the AFL… bring on season 2014 and go Hawks!